More than two million people who buy only a landline telephone service from BT would see their monthly bills cut by at least £5 per month, under plans announced by Ofcom today . Ofcom has reviewed how the market is working for customers who buy only a landline service from a provider – either because they do not want broadband or pay TV, or because they take these services under separate contracts, usually from different companies. Landline-only customers are particularly affected by price hikes in telephone line rental. 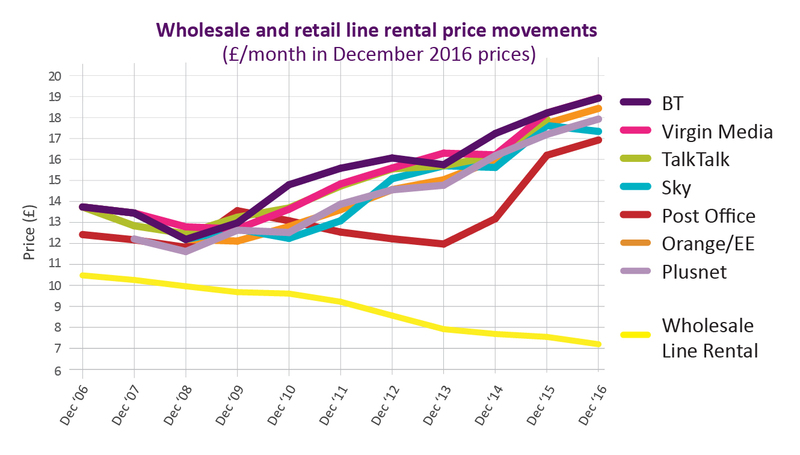 Major providers have increased their line rental charges significantly in recent years – by between 25% and 49% in real terms. This is despite providers benefiting from around a 26% fall in the underlying wholesale cost of providing a landline service (see chart). The cut would return the cost of line rental to 2009 levels in real terms, effectively reversing price hikes for landline-only customers. Sharon White, Ofcom Chief Executive, said: “Line rental has been going up, even as providers’ costs come down. This hurts people who rely on their landline the most, and are less likely to shop around for a better deal. We think that’s unacceptable. Customers of ‘bundled’ services – packages including landline, broadband and/or pay TV – benefit from a range of attractive deals, driven by strong competition. By contrast, offers for landline-only customers have become increasingly limited, with a number of providers withdrawing their telephone-only products altogether. Almost 80% (2.3m) of the UK’s 2.9m landline-only customers are with BT. Ofcom has found that BT’s market power has allowed it to increase prices without much risk of losing customers. Other providers have then followed BT’s pricing lead. We expect that our proposed cut in BT’s prices would lead to other providers following suit and reducing theirs. This would mean savings for landline-only customers across the market. Ofcom is proposing, and seeking views on, a range of £5-£7 per month for the cut to BT’s landline-only line rental. We will take into account the need to protect consumers, while also preserving competition and ensuring that competitors to BT can profitably attract new customers. Ofcom also intends to require BT to trial different approaches for communicating with its landline-only customers. This is to help them better understand what they are paying, and how other BT packages – or even other providers – might offer better value for money. On average, landline-only customers have been with their provider for more than 20 years, compared to eight years for phone with broadband customers, and four years for triple-play customers. 43% of customers with a standalone landline contract are 75 or over, while 35% live in DE households on the socio-economic scale. Furthermore, 70% of landline-only customers have never switched provider, or considered doing so. 2.The planned price cut would not apply to landline services sold by BT Consumer as part of a bundle of services including broadband. 4. These proposed safeguards would cover the line rental, call charges and the call package add-ons. BT would be permitted to increase revenue for these service by no more than the Consumer Price Index (after the one-off reduction in line rental has been applied). In addition, we are proposing a specific control on the line rental charge, that would ensure BT could not increase this charge significantly more than inflation. Ofcom publishes information to help landline customers choose the right tariff to match their use. This includes information on the low-cost services available for customers in receipt of certain state benefits. Guidance on switching landline is also available.